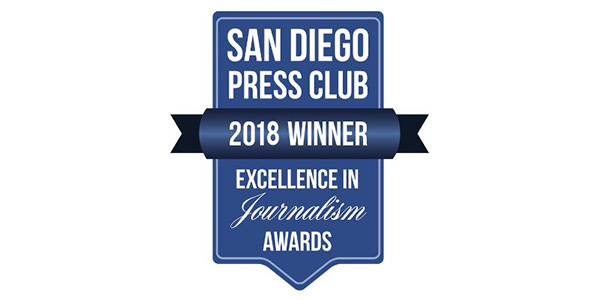 On Tuesday, Oct. 30, nearly 500 members of the press gathered at the Joe & Vi Jacobs Center at Market Creek for the 45th annual San Diego Press Club Excellence in Journalism Awards. More than 400 awards were given out to local magazines, non-daily newspapers, online and daily newspapers, trade publications, podcasts, radio stations, television channels and their writers, reporters, editors, broadcasters and photographers. La Mesa Courier parent company San Diego Community News Network (SDCNN) earned five awards in total under non-daily newspapers categories. Jeff Clemetson, editor of the Mission Valley News, La Mesa Courier and Mission Times Courier, earned first place in the Non-daily Newspapers, Series category for two articles that ran in the Mission Times Courier — “Remembering Pearl Harbor” and its partner “A Fortunate Encounter.” The series began with a story about Allied Gardens resident Arthur Roemmich, a 100-year-old veteran who served on the USS Northampton — a ship that was saved from being bombed in Pearl Harbor. After reading the article, San Carlos resident Felicia Hamwey realized her father, Lloyd Smith, was also aboard the USS Northampton. Hamwey then organized a reunion for the two WWII shipmates, which was featured in the second part of the series. To read the series and the letter to the editor from Hamwey, visit bit.ly/RememberingPearlHarbor. Sara Butler, editor of the San Diego Uptown News, was presented with two awards. The first, second place in the Non-daily Newspapers, Public Service/Consumer Advocacy category, was for “Dockless Bike Craze.” The Uptown News story featured a comprehensive explanation of the different types of dockless bikes in the Uptown area and highlighted how locals felt about their sudden appearance. Visit bit.ly/DocklessBike to read the piece. Butler also placed second in the Non-daily Newspapers, Breaking News category for “Turning Down the Music,” in Uptown News. The story broke the news that Lestat’s West would be closing its doors, and Butler was the only local journalist to meet with its co-owner. To read the award-winning breaking news story, visit bit.ly/TurningDowntheMusic. Albert Fulcher, editor of Gay San Diego and San Diego Downtown News, earned two awards. The first was for “Beating the odds” — a feature story for Gay San Diego about Marine Corps veteran Liz Carmouche, the first openly gay lesbian mixed-martial arts fighter. “Beating the Odds” won second place in the Non-daily Newspapers, Military category. To read the story, visit bit.ly/Caramouche. Fulcher was also awarded first place in the Non-daily Newspapers, Reviews: Live Performance category for “Empowerment Through Music,” published in Gay San Diego. “Empowerment Through Music” reviewed the San Diego Gay Men’s Chorus’ “Movie Night” held this past April. To read the award-winning review, visit bit.ly/Empowerment­Through­Music.